NOTES: Resin with etched brass, aluminum and rubber parts. Unlike most exotic supercars, the Saleen S7 racing version, the S7R, has already proven itself on the international motor sports stage. During the past several years, the racing version has been on pole and set fastest race lap more than 50 times and has won nearly 40 races around the world. This incredible record includes capturing several GT Manufacturers’ championships and GT Drivers’ championships, winning the grueling 12 Hours of Sebring and setting a new track record at the famed 24 Hours of Le Mans. During the past 20 years Saleen has won eight Manufacturers’ Championships in GT sports car racing and several Drivers’ Championships as well. The S7R competes in the American Le Mans Series in North America, where it has had a great deal of difficulty dealing with the very fast Corvette team. In Europe Saleen S7Rs continue to win poles, set fastest race laps and win races in the highly competitive FIA GT Championship. This particular kit from Provence Moulage is for the two cars entered into the LeMans 24 hour race in 2001. Though I'd have rather had an American LeMans version, it is quite understandable for a French company to be providing markings for a FIA GT version. 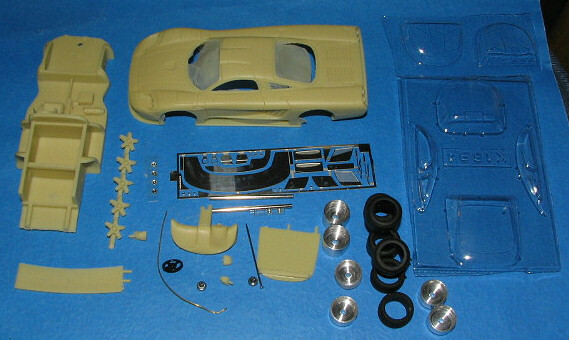 My only other P.M. kit was their Porsche 908 spyder kit and based on that, I decided to take the plunge with another kit. I am not disappointed. The kit has the correct balance of photo-etch and resin parts, not relying heavily on cast metal as do other companies for detail bits. This may result in a slightly lower level of detail, but I've found most cast metal parts to be not as well molded as I'd like, though it may well be I've chosen older efforts. This kit has a full resin body and lower chassis section with the interior molded in. Other resin parts are provided for the instrument panel, backlight cover and the wing with its supports. Another sprue has five wheel inserts of which only four are needed, so there is a spare. This worked well on the Porsche. Photo etch is used for grilles and aerodynamic panels. A straight pin is provided for the shift linkage and the headlight covers and windows are vacuform. The delinea tion of these parts is rather faint and the plastic rather thin so this will need great care to prepare. Two solid steel axles and six wheels and tires. The wheels are turned aluminum with four of them being the same size and two others wider. The tires are rubber/vinyl and are three different sizes. Two wide ones and four narrower ones, with different inner circumferences. No mention is made of this in the instructions so I'm not really sure what to make of it. No matter what occurs, I'll have a spare set. A section of wire is also provided. The markings are quite extensive and consist of two well printed and somewhat large (for these cars) sheets. They were wrapped around the rest of the parts so are quite curled. This will not be a problem as long as I don't wait a decade to build the kit! A set of full color instructions are provided with all the printing on one side of the sheet of paper. The majority of the space is taken with decal placement and color information. A small exploded diagram shows general parts placement. There are assembly notes in both French and English scattered around the sheet. I found this to be more than adequate with the 908 and they should be good enough for this as well. Both Le Mans 2001 cars are provided for on the sheet so one can do either option. I fully anticipate this being a rather nice build with no real issues. This is because these kits are well designed so make for a pleasant experience. Thanks to me for this one.